If you’ve never dared to participate in an art contest, then here is your chance. Regardless of your age and artistic ability, you can take part in the Impressions of Margaret River Art Competition for an opportunity to win a shopping spree worth $1000 at Bradshaw’s Mitre 10. All you have to do is design an artwork with one of the Dulux Design paint collections available at Mitre 10. All artworks will be on display at the store from October 01st to 14th, and the winner will be selected through public vote in store and online. For details visit Mitre 10. Small local businesses that have shown amazing social awareness and generosity during the last 12 months will be awarded at the 2012 Margaret River Chamber of Commerce & Industry Business Awards. The winners and finalists will be announced during a 3-course dinner scheduled for Thu, September 27th. The finalists and winners will get a short professional video footage of their business made by local movie company Illusory films, which will be screened at the dinner. 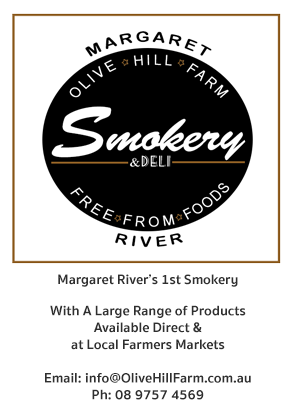 For information call Keely Robertson at 0498 349 493 or email admin@margaretrivercci.asn.au. Around 70 people were part of the Greens party meeting at Margaret River Education Campus last Friday night to hear Christine Milne, leader of the Australian Greens. Supported by Giz Watson, Nerilee Boshammer, Senator Scott Ludlum and Rachel Siewert, Ms Christine talked about the need to battle climate change and how Margaret River’s campaign against coal mining inspired her. The meeting was also attended by local identities Cr Lyn Serventy, Ian Parmenter, Peter Lane, Brent Watson and Rod Whittle. A seminar entitled Facebook for Business will be held at Broadwater Resort in Busselton on Wed, October 10th from 10am to 4pm. Organised by Sharyn McCaskey, the seminar will cover over 40 Facebook tools to promote your business, attract traffic to your page, integrate your Facebook page with your website, and much more. Ticket is $33 and includes GST. For registrations please call 9754 8555 or go to www.smallbusinesscentresouthwest.com.au. The Small Business Development Corporation of Western Australia will conduct an online survey of small locally owned businesses to find out their strengths and the areas in which they need help. The survey is mostly MCQs and those who complete it will get an opportunity to win an iPad. The closing date is Fri, October 12th and the prize will be drawn on Fri, October 19th. If you are interested in participating please visit http://www.survey.smallbusiness.wa.gov.au. Get ready to enjoy a memorable afternoon of tea, fun-filled activities and games as Amaze’n hosts High Tea for Habitat on September 16th, 2-5pm. High Tea for Habitat takes place in September each year to support Habitat for Humanity Australia, which constructs houses for needy families across the Asia-Pacific. Tickets are priced at $20 and there will be a prize for the best dressed. For more information or tickets contact Kerry Brooks at 0457 600 727 or studio@kerryellen.com.au.